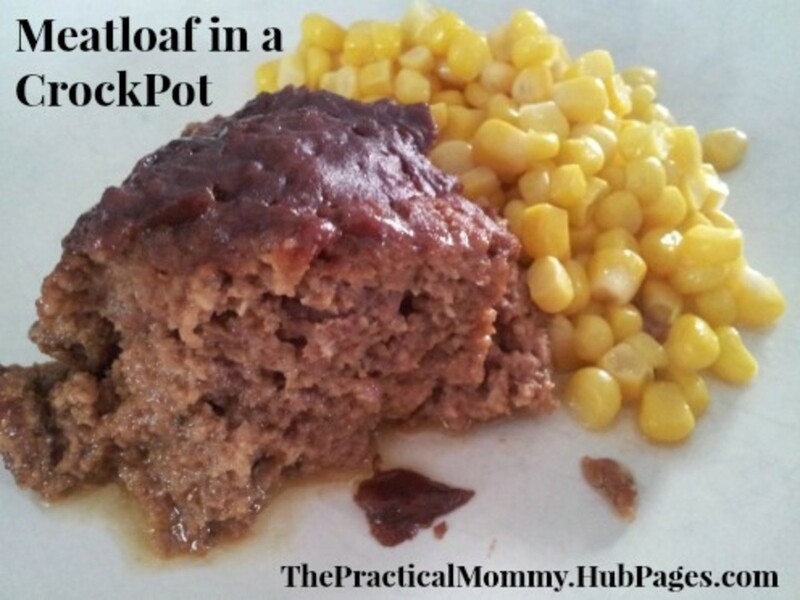 From Freezer to Crock Pot to Plate! With a busy two-year-old and a clingy newborn, I knew I needed some easier solutions for quick dinners. I did some research and decided to start making frozen crock pot meals. I mean, how easy is it to pour a bunch of ingredients into a bag, freeze it, then pull it out of the freezer, dump it into a crock pot, and serve? So here you'll find two chicken recipes I love, both with a barbeque theme. With many similar ingredients, it's easy to fix them both at once. And I love having an easy solution for serving food that's super quick but not full of preservatives or mystery ingredients. I used chicken thighs for both recipes, partly because I like the taste of dark meat and also because they're cost effective, but you could use breasts, or even legs, if you prefer. 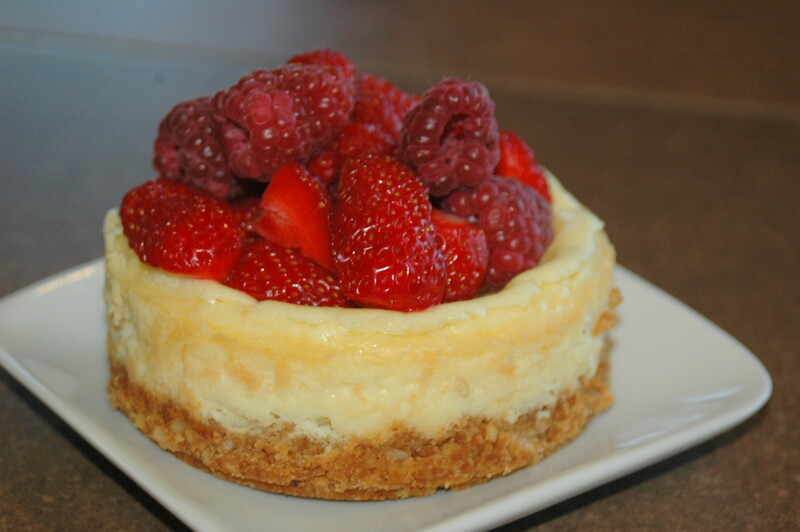 You can also adjust the ingredients to fit your personal tastes. I love garlic, for example, so I always add a little more than a recipe calls for, and I also always press the garlic (instead of mincing) to save time. Saving time, after all, is what these recipes are all about. 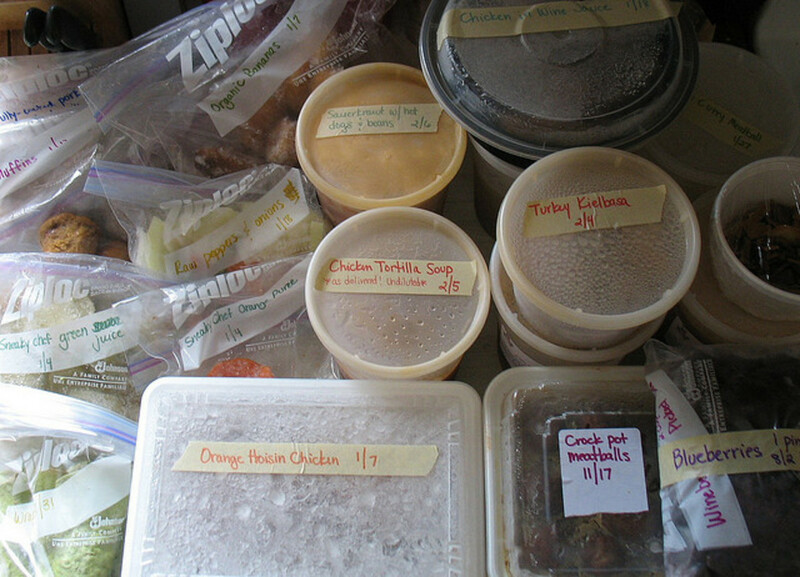 The freezer bags are the easiest way to store these meals, as opposed to some other type of container. They can be frozen flat, taking up very little space in the freezer. Plus, after freezing the meal flat, you can then stack them or store them on their sides or upright. To make filling the bags easier, be sure to fold over the tops, so that they form a bowl and you don't get the ingredients trapped in the seal. It's also easier to label the bags before you fill them. The best thing about these meals is that you can make so many of them in one day, and then have many nights of home-cooked meals with little to no time spent in the kitchen. I always make multiple meals at a time, because once you start chopping the ingredients, it really takes very little extra time to chop a few more. So, for example, if you make both of the recipes listed here at the same time, you'll have four dinners prepared because they both make two dinners. 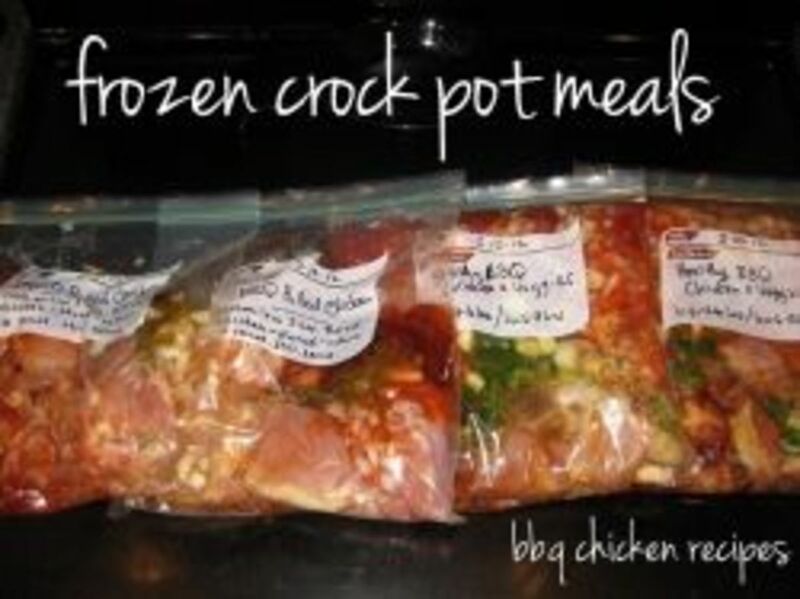 The meals are easy to transfer from freezer to crock pot, too. 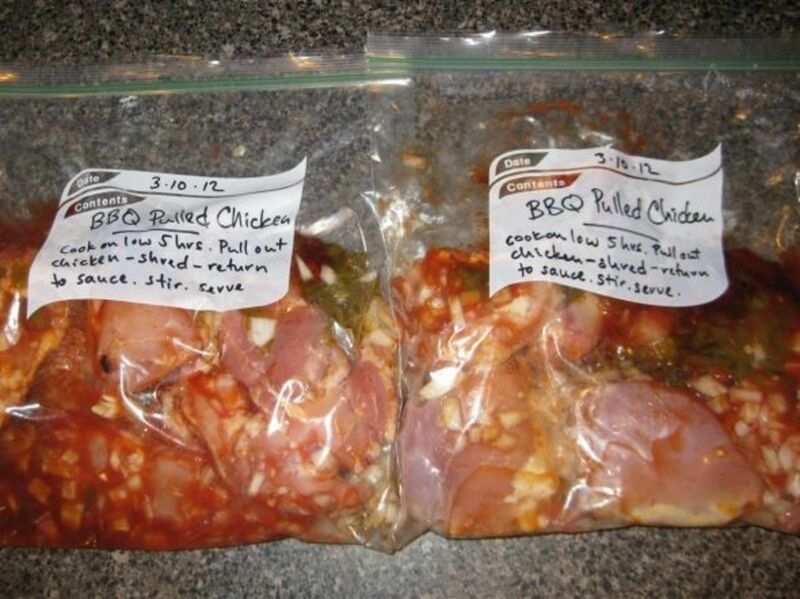 You could put them in the refrigerator to defrost, I suppose, but I just pull them right out of the freezer, run the bag under water in the sink just long enough to work apart any pieces of chicken that have frozen together (just a minute or two) and then dump it into the crock pot. Simple. I love this recipe. It's juicy and spicy and tender and oh, so good! It makes a great sandwich, works well for dinner and as leftovers for lunch or dinner again, and is easy to make and to reheat. I love to serve it with some cool Coleslaw. The spiciness can be adjusted to your tastes, but even my toddler loves this dish. Evenly distribute all ingredients between two, one-gallon-sized freezer bags. Massage or shake to mix, label, and place in freezer. On the day of cooking, dump contents of one bag into slow cooker and cook on high for 5 hours. Remove chicken and shred with two forks. 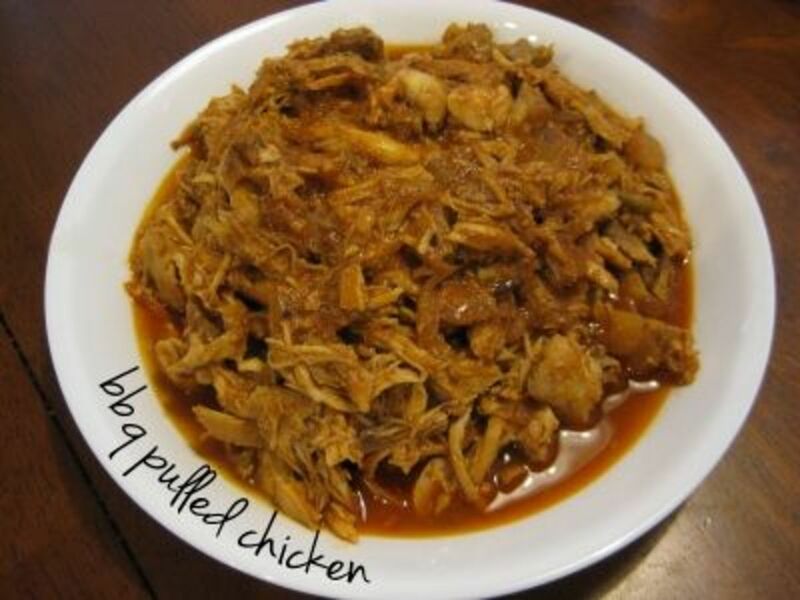 Mix pulled chicken back into sauce in slow cooker and stir well before serving. The chicken can be eaten on its own or on sandwiches. Each bag serves 4 to 6. Make multiples of the recipes at once to fill your freezer with easy dinners! 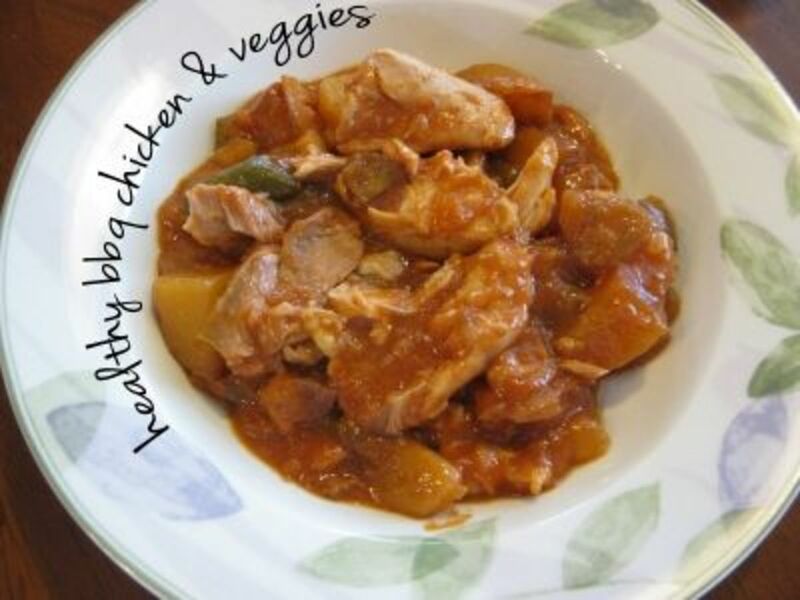 This recipe is a great way to work some flavorful vegetables into a hearty and delicious chicken dish. I haven't tried it with breasts yet, since I prefer dark meat, but you could substitute white meat and add in more veggies to amp up the health factor. Also, you could try substituting sweet potatoes for the red potatoes, but my husband doesn't like them, so I try not to mix them into dishes. Evenly distribute all ingredients between two, one-gallon-sized freezer bags. Massage or shake to mix, label, and place in freezer. On the day of cooking, dump contents of one bag into slow cooker and cook for 4 to 6 hours on high or 6 to 8 hours on low. Each bag serves 4. Don't Forget to Label the Bag! It's easiest to label the bag before it's filled. Be sure to put the date you made it, the name of the dish, and the instructions for cooking. Time Savers - Looking to save even more time in the kitchen? Have some of my favorite tools on hand! Never waste time chopping garlic again! Not just for pizza - great for grilled cheese and french toast, too! Makes quick work of peeling! Don't feel like chopping an onion or zucchini? Grate it instead! Comes with a handy catch-all container, too. Chop, scrape, move, lift ... it's like an extra hand in the kitchen! 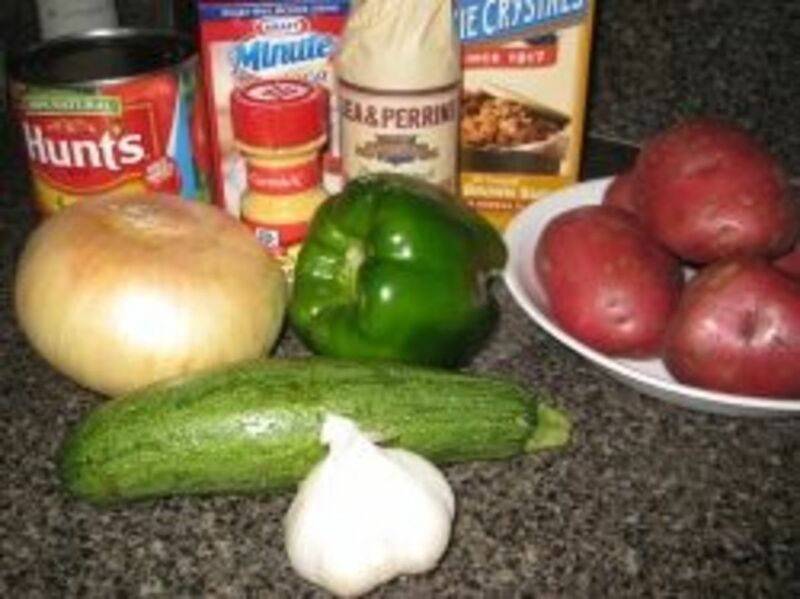 Looking for More Crock Pot Recipes? - Check these out, or enter your own search terms! Leave a Note! 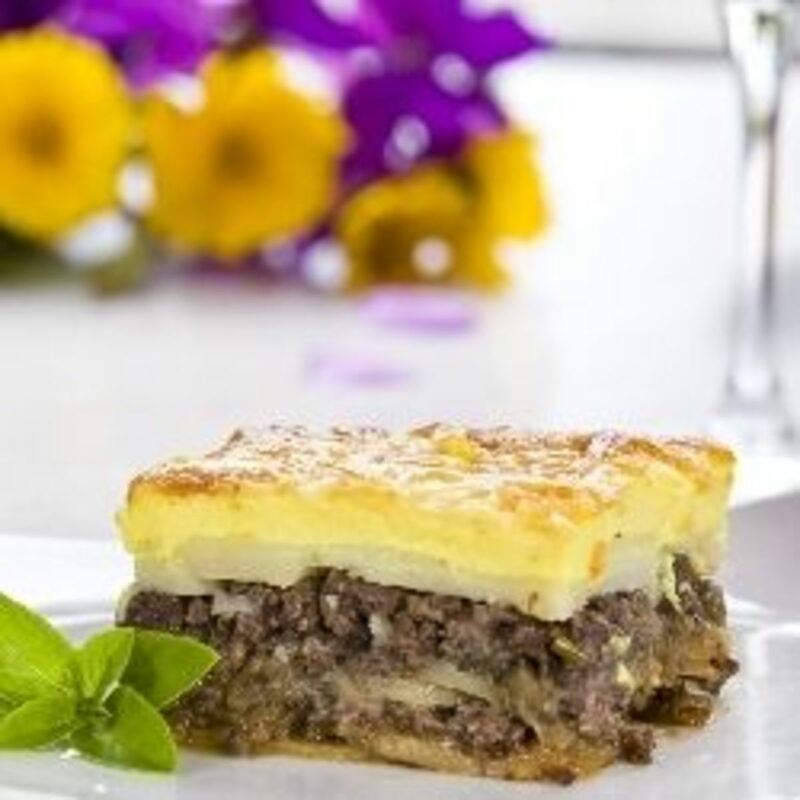 - Have you tried these recipes? Do you have a favorite freezer or slow cooker recipe? Let us know!